We are excited to be participating once again in Tinkerlab's Creative Challenge! 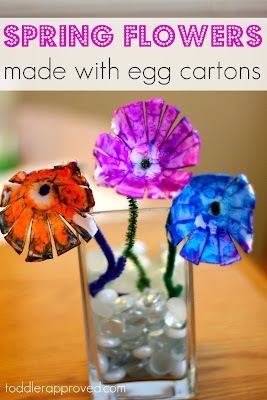 This month the challenge was to create with egg cartons! 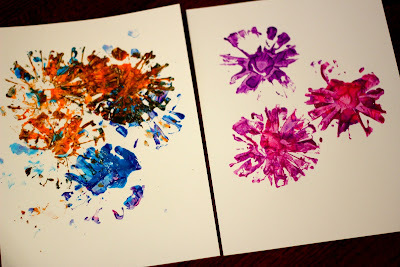 We are loving all things Spring at our house right now... so we tried out a new-to-me flower painting/creating technique and it was a smashing success! Cut out your egg cartons into little pieces. Then snip them all the way around to make them look like flowers. 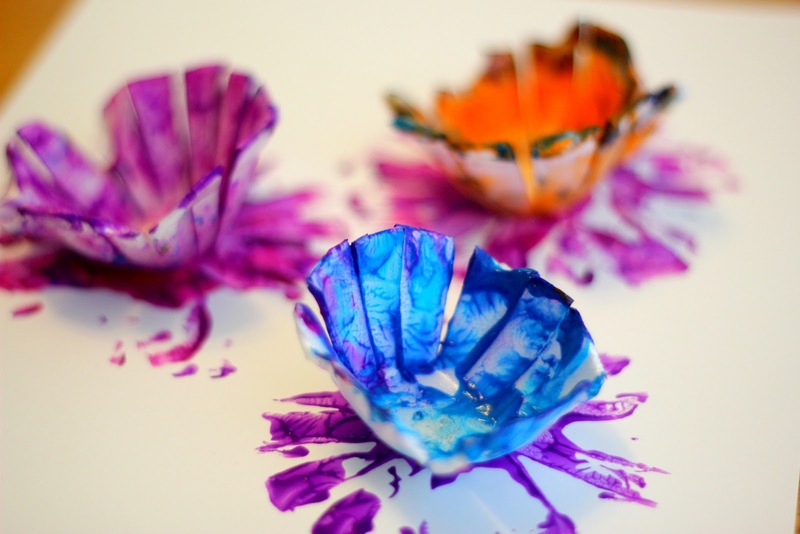 Dip the egg cartons into your paint and then smear them around. Press onto your paper to make egg carton flower prints. You can make a layered flower creation to display in your home art gallery or a few egg carton flowers to place in a little vase... and this will simply add a little Spring to your home. I loved the vibrant colors in this activity and my son loved how his egg carton flowers made fireworks on his hands. I love how simple things delight 4-year-olds. What have you created with an egg carton? Make sure to stop by Quirky Momma to see the egg carton game I am sharing over there today too. I am excited to be participating with so many awesome bloggers in this creative challenge. Check out their blogs by clicking on the different links below. I promise you will be amazed at all of the awesome ways to use egg cartons. If you want to share your own idea, head over to Tinkerlab and link up your idea in the creative challenge linky or come share it on our Facebook page! Happy creating! Kristina, these are so beautiful! I can't wait to show my kids -- I know they'll want to try this right away. Thanks Rachelle!! and thanks for such a fun challenge! I always look forward to these! Can't wait for the next one. Oh my these are SERIOUSLY pretty! I LOVE THEM! Thanks Maggy. I get a little giddy myself when a project looks pretty AND was messy and fun too... it is so exciting! These are gorgeous, and they look like a blast to make! I want to do this with my little guys. 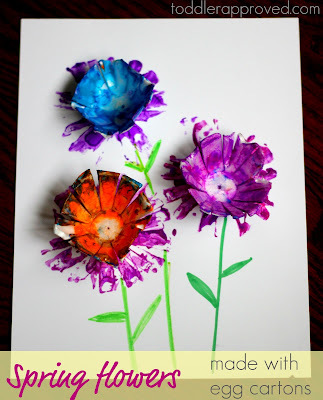 The egg cartons made such great flower prints! Combining the prints with the egg carton flowers themselves is so clever! Thanks! We like things that pop out at our house, so it was fun when we came up with this! Beautiful! Love the 3D effect of the flower against the flower background. Love that the painting utensil becomes something beautiful as well! These are so pretty! Can't wait to try them with my little guy. Thanks! Very awesome posting and very great ideas. thanks a lot sharing for me. We made this project today! Here's how ours turned out http://anniealongfortheride.blogspot.com/. Thanks for the great ideas!! nice posting so wonderful and thanks sharing for me. Thanks for sharing these beautiful images and some interesting tips about related flowers.